Having just finished the second part of what I changed during my big change up in January, I thought it was about time for an update of what I've been up to for the last month. If honest, I haven't done as much game development as I would have liked, mainly due to feeling quite fatigued from spending too much time in front of a computer screen. But also because I haven't been in the mood due to me having a few bugs and issues that were making me give up. These issues being collision detection (again) and graphical glitches. The graphical glitch was inadvertently answered while watching an episode of Indie Chatter (Great video log by the way) and ended up being a simple rounding error which was caused by my 2D camera. So that was nice. 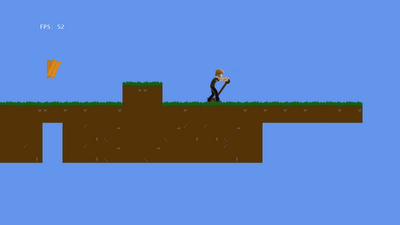 But collision detection I just couldn't get right. I either had it working with perfection, but having the camera dip as my avatar ran. Or I had it not as perfect, but having the camera stable. Then it occurred to me; why should I only have one method or another. So now I determine the collision code as I see fit and have the less perfect collision detection for ground tiles (the ones that were causing all the headaches). I also had issues with collision detection against my moving platforms and transfering its velocity to the player to make sure they were pushed by the platforms. This again has now been fixed. So once those glitches were fixed, I was then in the mood to create new things. One thing that has been added is to have the level pan out once you reach the end of the level. This is how I took the screenshot of the title picture. I've added this because I thought the player might get a level of satisfaction out of seeing what they had just completed. Althought this might come back to bite me if I decide I want collectables that are hard to find. The second thing I have created is a lever that can be assigned to any number of other interactable tiles. Currently I've only linked it up to a movable platform which can be turned on and off, but it has been designed in such a way that it could easily be linked to other tiles. Below you can see my avatar pulling the lever (using the stock "pull" animation from the avatar animation pack). But this has lead me down a difficult road with having the avatars as the main character. Unfortunately, the only way of creating animations is by having a nice expensive piece of software (i.e. Maya or 3D Studio Max). A free piece of software did once exist, but has since been revoked. This means that I'm currently building my assets against the animations that come in the avatar animation pack. At the moment this isn't a huge problem, but could become one for any of the future tiles I might create. This has definitely widened my eyes as to why so many avatar games have such a limited supply of animations. In the coming weeks I hope to implement an interactable button that will act as a different kind of switch and hopefully the main menu and pause menu. This will hopefully make me more productive when testing levels and also get it out of the way before I've completed all the fun tasks.